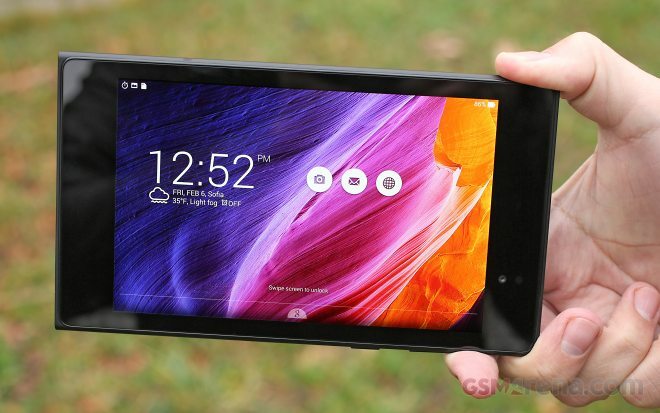 The Asus Memo Pad 7 is a top-tier compact tablet with a 7″ 1200 x 1920px IPS display, 64-bit Intel Atom Z3560 chipset, 2GB of RAM, a 5MP camera and 16GB or 32GB of built in storage that can be expanded with a microSD card. The Memo Pad 7 also features an attractive design with a textured back, a clean glass front and stereo speakers on the top and bottom (or the sides in landscape mode). 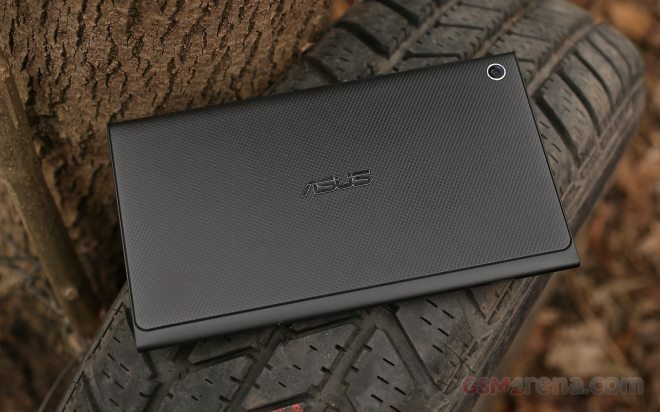 Asus relies on its own design, capable hardware and a blend of Android that’s close to stock but with an Asus paint job for the Memo Pad 7. The result is a customizable slate that’s also easy to get started with, thanks to it being as close to Google basics as possible. Take a look at the slate in action below. You can get the Asus Memo Pad 7 in a variety of colors, including Burgundy Red, Champagne Gold, or Gentle Black – ours is the latter. The build is completely forged from plastic but there are no glossy parts to be seen making the Memo Pad 7 feel great and solid in the hand. The back has an interesting design aesthetic with a textured curve that runs all the way to the edge where it meets a thin line of matte plastic surface. The Asus Memo Pad 7 is also very light at 269 g which is lighter than the Sony Xperia Z3 Tablet Compact (albeit an 8″ slate) and the 7″ Nexus 7 (2013). The display is of very high quality. The panel is bright with vivid colors and great viewing angles. At 323ppi the 1200 x 1920px panel is tack-sharp too – it’s especially evident when browsing on the slate as text is rendered perfectly. We can safely say it’s among the best panels we’ve seen on a tablet. Thanks to the potent Intel Atom chipset the Asus Memo Pad 7 runs very fast and smooth and we didn’t notice any stutters while using it regardless of the number of opened apps. Currently, you can get the Asus Memo Pad 7 for less than €200, which is not half bad for the quality of the hardware you’re getting. Stay tuned for our full review, it’s coming later this week.